Nine times out of ten these days your search is going to begin with the the good ‘ol internet or “innerwebs” as frequently thrown about now. The internet has put the search for old iron at our fingertips that can easily be done from our living room recliner. Gone are the 80’s when my friends and I would beat feet down to the corner market every Thursday when the new Auto Trader came out just to see if we could get a jump on any new listings. Now we just sit back and wait for e-mail alerts or text messages when our favorite cars show up. Probably the most common web source for cars and parts is Craigslist. 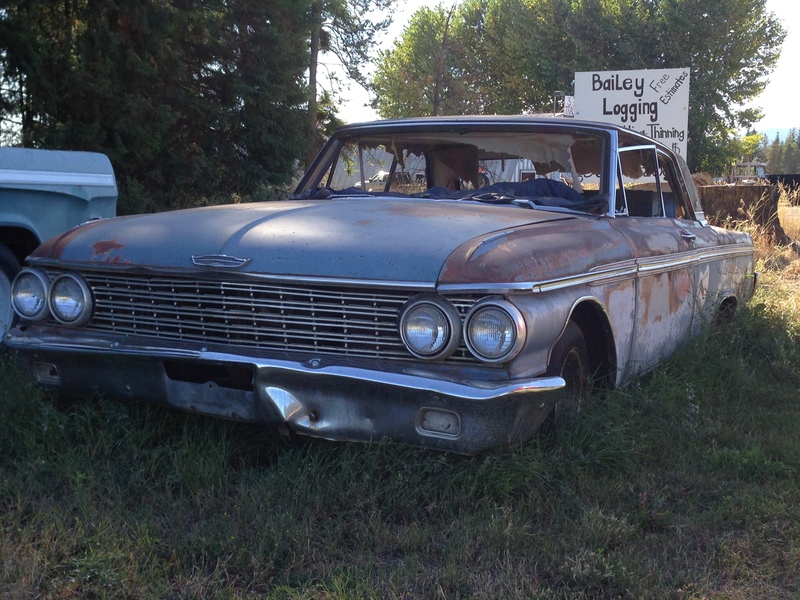 If you haven’t heard of Craigslist you have been living under an Edsel somewhere. It is easy to use, free if you’re not a dealer, (and might I add addicting) but there is also some risk involved. There is no buyer protection with Craigslist so make sure you thoroughly vet your seller. Many cities now have special safe places, next to police precincts for instance, for folks conducting Craigslist transactions. Some Craigslist ads are very professional, others are not. For example when searching for the term Galaxie, also search under Galaxy (many people still insist on spelling it this way even though it’s never spelled this way on the car). Some sellers will include many detailed photos, others will give you one blurry shot of the right front corner and some will include no photos at all. Unfortunately Craigslist has a lot of flakes so there will undoubtedly be many un-returned phone calls and un-answered e-mails. Many times a grandchild will have posted the car for their computer illiterate grandparent and it can take a lot of legwork to reach the actual seller. Sometimes these leads pay off, sometimes they dont. Use sites like searchtempest.com to search multiple geographic areas on Craigslist. I’ve bought and sold many cars and parts on Craigslist and my result has been overly positive but I always proceed with caution when dealing with people I don’t know. Next we have Ebay. Ebay is a popular auction site which gives the seller a global audience if they so choose. E-bay also has buyer protection. Ebay also has fees which apply to the seller. Ebay listings do tend to be a little more professional than Craigslist but you’ll still encounter vague descriptions and poor photos to some extent. Sellers wanting top dollar for their ride learn quickly that a professional listing matters. Another factor to consider with Ebay is that the car your bidding on may be on the other side of the country so shipping costs become a factor. If you’re considering a car that is not close enough for you to personally look at, I would recommend having an appraiser check out the vehicle, especially if there is a large amount of money involved. Request additional photos of the car if necessary and be wary of a seller unwilling to send them (remember when we used to actually take photos, have them developed, and physically mail them to a prospective buyer?). I have also used Ebay countless times and had mostly good results. While Ebay and Craigslist seem to be the most often used online tools, there are some other online classified sites that can be utilized as well. Auto Trader Classics, Classiccars.com, Oldride.com, cars-on-line.com, and oldcaronline.com to name a few. Some of these sites will feature a fair amount of dealer content, many of the cars being priced at high retail although you will find some private listings scattered throughout as well. Bringatrailer.com is also gaining some traction these days. 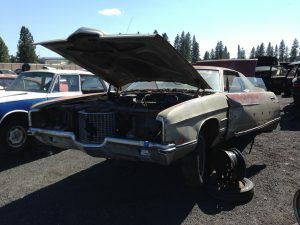 This is a live auction site where you can bid on hand picked classics. One of the main things differentiating bringatrailer.com from Ebay is that a potential buyer must use a credit card to make a deposit on a car he or she wishes to start bidding on. Typically there are less cars to choose from as compared to Ebay but the vehicles presented have very complete descriptions and a lot of information. Also most online vehicle forums and clubs have a classified section where members can post their cars as well. Now let’s shift our focus to the elephant in the room. Print media. Many say these days that printed publications are dead but they just don’t know it yet. Let’s face it though, some of us just like our books and magazines. It just doesn’t feel right taking a laptop computer into the bathroom, but a printed copy of Hemmings Motor News, no problem! Hemmings has been around for a long time and is an excellent place to look for cars as well as parts. Hemmings has a viable online presence as well. Don’t forget local Nickel Ads or like small regional classified publications, there can be some real gems in these. 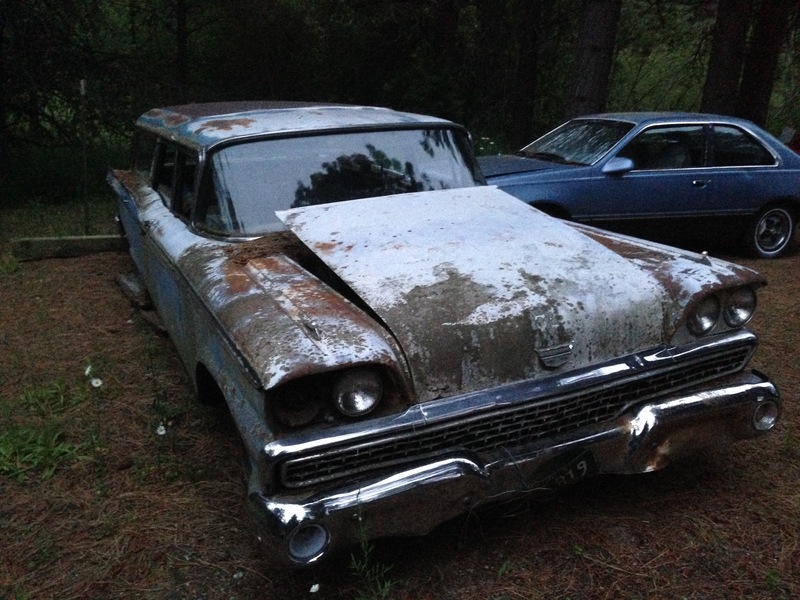 You may even find that rare one-owner Country Squire wagon in your local newspaper want ads. Some folks still use these so don’t dismiss them when your hunting for your next project or driver. And unlike Craigslist, you won’t have a hundred other people trying to get to the car before you since many people have written print media off these days. Millenials may not even know about print media. So next time your driving through that sleepy little farm town off the beaten path, stop at the local gas station/mini-mart/coffee shop laundromat and pick up that areas want ads. You never know when you’ll open that thing up to: Old Galaxie in barn, has two carburetors, manual transmission, rear tires bald, ran when parked. $1500. We can always dream. And then there are auctions. Everyone these days has heard of Barrett-Jackson. A lot of folks in the old car hobby bemoan the thought of cars selling through the big auction houses. “Those big auction companies just drive the prices of all old cars up so they’re not affordable for anyone.”, they wail. I simply find this not to be the case. Of course there are the one-off’s, those 1 of 1 cars with a $1500 new old stock fan belt that sets a record for that particular model. Those cars are rare, and most of us couldn’t afford them with or without the auction houses. Of course there is the guy that lists his ’66 Ford Custom 4-door sedan with a six cylinder for stupid money on Craigslist because he saw a ’65 R-code 4-speed car sell for $75,000 on TV. Truth be told, this is not an example of auction houses driving prices up, because that ’66 Ford Custom 4-door isn’t going to sell with a high price tag on it. Just because someone asks a ridiculous price for their what should be a parts car doesn’t mean that Barrett-Jackson drove the price up, it just means the owner is delusional. The market is still the market. In fact, as of late, I’ve seen many people score really nice refurbished cars at auctions for pennies on the dollar compared to what the owner put into the restoration. While Barrett-Jackson is the most popular due to their extensive television coverage, there are many other collector car auctions including Leake, Mecum, Russo-Steele, and here in my hometown of Spokane, Washington, Silver Auctions. If you live in or near a larger city don’t be afraid to browse your local dealer auctions as older cars occasionally slip through these as well. The last method for searching out your first FullSizeFord involves something that we as a society just don’t seem to want to do anymore. Talk to each other! Don’t be afraid to beat the streets and just get out and talk to folks. If your looking for a particular car, go to a local car show and ask around. Within a couple of conversations, you’ll run into some seasoned car show veterans who “know a guy who’s got one those out in the woods behind his house”. Look for garages or shops that look like they’re into old cars, they’ll know where some cars are. Just get in your rig and drive. 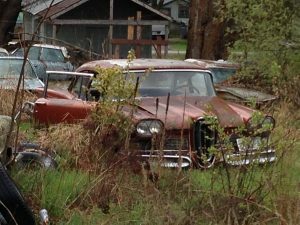 I’ll sometimes load my kids up (I’ve trained them to spot old cars) and we’ll just start at one end of a neighborhood and work our way to the other side, looking for stalled projects sitting beside houses, under carports, and in backyards. Remember, no trespassing! If you see something you might want to investigate further, ring the doorbell and politely ask if you can take a closer look. If no answers, leave a card with your contact info. If they don’t get in touch with you, respect that, the car most likely isn’t for sale. 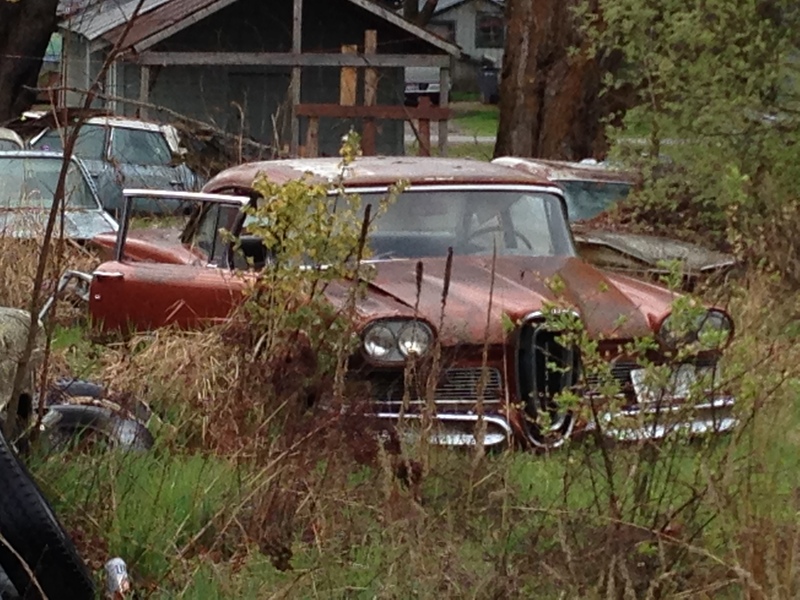 1958 Edsel resting in a side yard. 1962 Ford Galaxie 500 2dr HT eagerly awaiting a new owner. We’ll close out with a few phrases to walk with caution on when checking out prospective FullSizeFord’s. Number one of course is “Barn Find”. We’ve already discussed the idea that not everything found in a barn is good so be wary of folks trying to fetch a higher price just for using the term. Another one being thrown around quite a bit these days is, “ran when parked”. This phrase means absolutely nothing unless the car was parked yesterday. Everything ran at some point. A friend of mine recently purchased a pickup that “ran when parked”. After handing over the cash, the seller informed him that it was “parked” 15 years ago. Needless to say, when he got it home and tried to get it it running, he found that the cylinders were rusted to the bores. Another term that can be misused at times is “survivor”. Just because it hasn’t been crushed yet doesn’t mean it shouldn’t have been. Now that you’re ready to go find that car you’ve been looking for, just remember not to show your hand upon arriving. Let the seller think you might be mildly interested. If you show up and start jumping for joy when you first lay eyes on the car, the seller knows he’s not going to have to drop his price much if at all. Remember, it should be a fair deal for both buyer and seller. On the flip side, be respectful and don’t be one of those guys who just starts nitpicking every little minute detail on the car, sellers don’t appreciate this. There may be times when they’ve misrepresented the car, in this case just be diplomatic and try to correct them (make sure you’ve done your homework) and if the seller insists that his ’62 Ford Ranch Wagon was special ordered with the 405 horsepower police interceptor 292 y-block (there wasn’t one), then I’d probably just walk away. Happy hunting and we’ll see you in the classifieds!